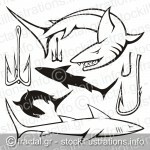 Shark and hook icons and silhouettes isolated on white background. 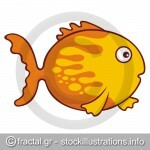 Single and entwined fish icons isolated on white background. Assorted fish icons isolated on white background. 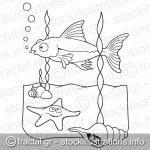 Underwater scene with fish starfish and shell cartoons, line art for coloring book page. Seamless pattern background of colorful happy, smiling fish cartoons. 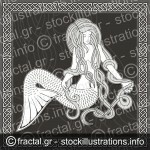 Illustration of a sitting mermaid with long hair on black background and celtic border. 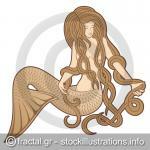 Illustration of a sitting mermaid with long hair on white background. 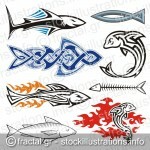 Tribal black and white jumping dolphin icon created with flame elements. 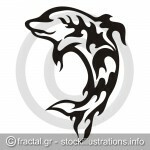 Simple black and white dolphin cartoon icon jumping out of water with water drops. 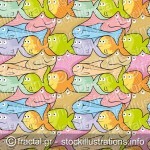 Surprised yellow and orange goldfish cartoon illustration isolated on white background.